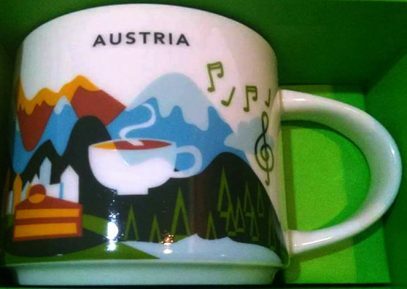 Starbucks is giving us a break from Christmas novelties by releasing regular You Are Here series mug – Austria. – Mountains, climbing gear – Austria is predominantly mountainous country. Top 5 highest mountains are: Grossglockner, Wildspitze, Weißkugel, Glocknerwand, Großvenediger. – Sachertorte – chocolate cake invented by Austrian Franz Sacher in 1832. Interesting enough, 5 December is a special cake holiday – National Sachertorte Day! – Musical notes – since Vienna was the European capital of classical music during 18th-19th centuries, many composers were attracted to the city. Among those Joseph Haydn, Wolfgang Amadeus Mozart, Ludwig van Beethoven, Franz Schubert and Johann Strauss.